Pentagon Grounds Fleet Of F-35 Fighter Jets Because Of Engine Problems : The Two-Way At an estimated cost of $400 billion, it is the Pentagon's most expensive weapons program. While ambitious in its scope, the program has had numerous stumbles. 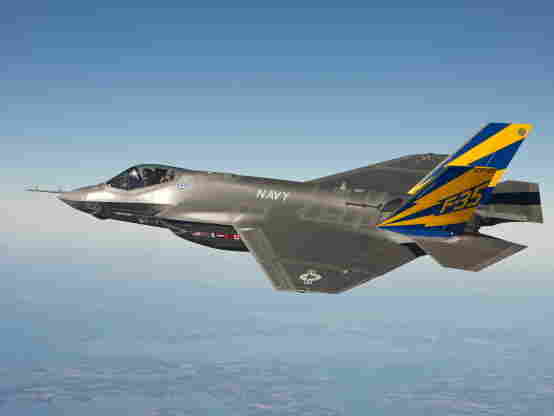 The Pentagon has halted the testing of its entire fleet of F-35 Joint Strike Fighters. At an estimated cost of $400 billion, it is the Pentagon's most expensive weapons program. "The move came nine days after the Pentagon cleared the F-35B jump-jet variant, designed for the U.S. Marines, to resume tests after a monthlong suspension. Both suspensions are due to problems with the engines. It also comes at a time when the program is facing increased scrutiny from lawmakers and senior DoD officials. "Unlike the last suspension, which was only for the B variant, this suspension affects all three variants: the F-35A Air Force conventional takeoff version, the F35-B for the Marines, and the F35-C carrier variant for the Navy." The AP reports that Kyra Hawn, Joint Program Office spokeswoman, said a routine inspection "revealed a crack on a low pressure turbine blade of an F135 engine..."
"Unprecedented in scale and ambition, the Lockheed Martin-run F-35 program has been beset by cost overruns, delays and design problems," Wired's Danger Room reports. "The Pentagon has steadily downgraded the plane's performance specs. Even so, it struggles to match its required blend of stealth, maneuverability, speed and range."